Tune in to the Saturday, May 17, episode of Chevy Hometown Kids on Fox Sports Southwest ! This episode will feature the LSGTPA Youth Class from the Hunt County Fair event in Greenville, Texas ! A brand new episode of Chevy Hometown Kids airs tomorrow, and boy do we have a lot of action in store for you! We’re kicking things off at a tractor pull in Greenville, Texas, working on our swing with LPGA pros at the North Texas Shootout, improving our basketball game with the XrossOver method, and discovering an adaptive sport pushing athletes to new limits at the “No Excuses Throwdown” event. CHECK OUT THE 'YOUTUBE' VERSION OF THE CHEVY HOMETOWN KIDS PROGRAM, FILMED IN GREENVILLE DURING THE HUNT COUNTY FAIR LSGTPA EVENT !! When it comes to history, Bonham, Texas is one of the richest towns in the state. The town originated with the construction of Fort Inglish, by settlers in 1837. The settlement was originally named Bois d'Arc, as land along Bois d'Arc creek was selected as the townsite. Bois d'Arc was renamed Bonham in 1844, in honor of James B. Bonham, who was one of the defenders at the Alamo. By 1873, Bonham had became a division point on the Texas and Pacific Railroad, and through the early 1900's was indeed a center for railroad activity. Among the historical sites in Bonham, the Bonham Depot still remains, and houses the Fannin County Historical Museum. The Texas and Pacific tracks still remain, and pass along the banks of Powder Creek, near Powder Creek Park and the site of the historic Texas and Pacific Roundhouse. 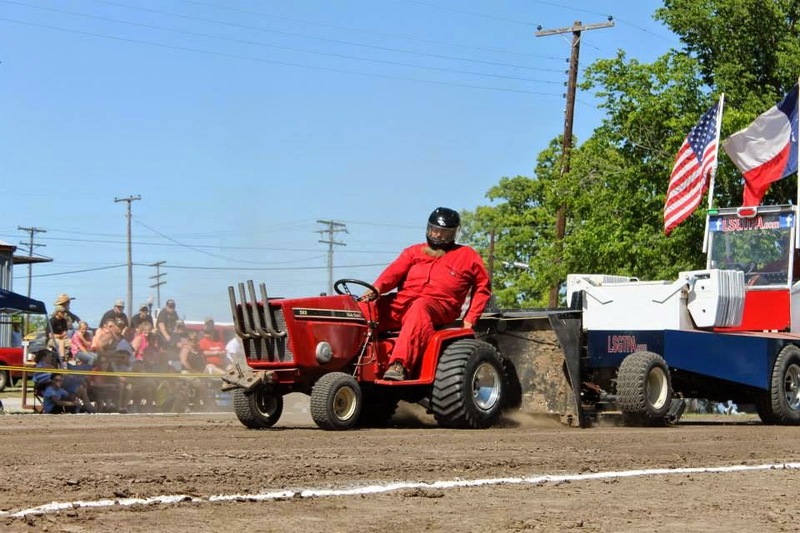 As such an historic railway stop, it was certainly an honor for the Lone Star Garden Tractor Pullers Association, to be able to include this site as the third stop on the 2014 tractor pulling season. 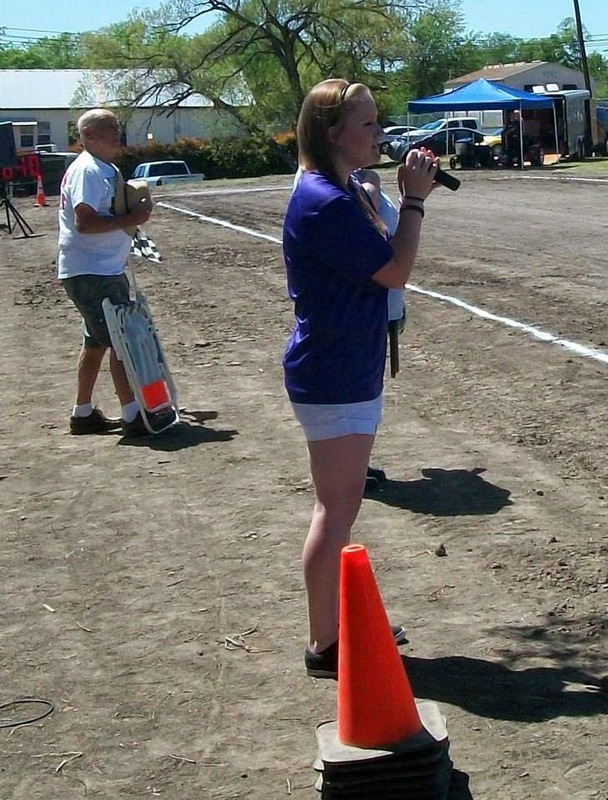 Grace Johnson of the Bonham High School Chorale, performed the National Anthem for the LSGTPA pull in Bonham. Held in conjunction with the 8th Annual Heritage Day Celebration, the LSGTPA event was to be conducted along side the storied T&P railroad, just a short distance from the Bonham Depot and the T&P Roundhouse. The newly constructed pulling track, was well packed and in great shape for the pull. Located just across from the scenic Powder Creek Park, the venue provided a great setting for the LSGTPA tractor pulling teams and easy access for the fans. Jared Stephan finds plenty of traction at the Powder Creek Park Pulling Track in Bonham. Bonham High School Chorale representative Grace Johnson, presented an awesome performance of our National Anthem, during opening ceremonies, to start the show. The Youth Class competitors then took to the new track, with Jared Stephan taking the win aboard his Outlaw Pulling Team sponsored 'Rusteze' entry. Magan Baird and Jared Stephan pulled to the second and third places, sharing driving duties aboard the 'Iron Head' tractor. Cassidy Bramlett piloted her 'Nacho' tractor to fourth, while Lane Duncan and his 'Texas T-Rex' tractor managed a top five finish. Mason Hovind placed 'Yes Deere' in sixth, followed by Kody Langham aboard his Bonham Service Center machine. 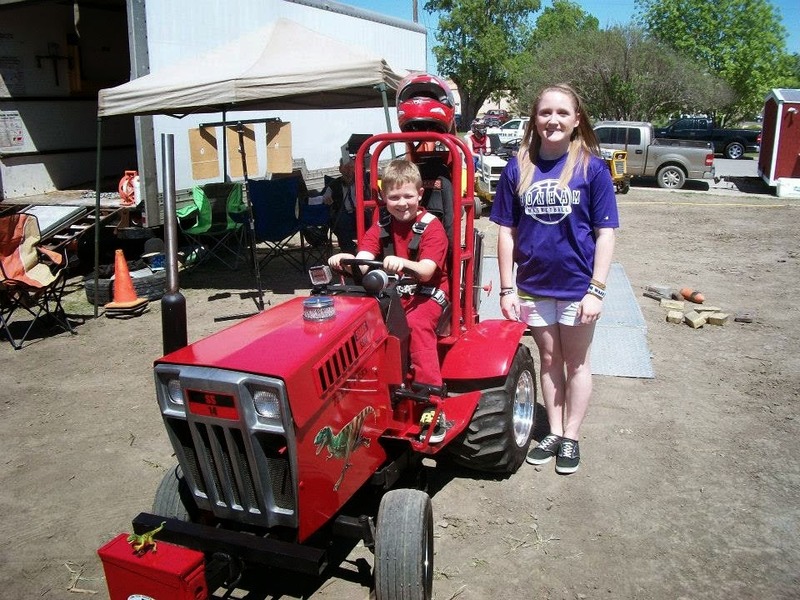 Lane Duncan had his 'Texas T-Rex' hooked up during the Bonham Heritage Day Tractor Pull. In Stock Class, Aidan Hovind pulled out the win, aboard the 'Rusteze' tractor. 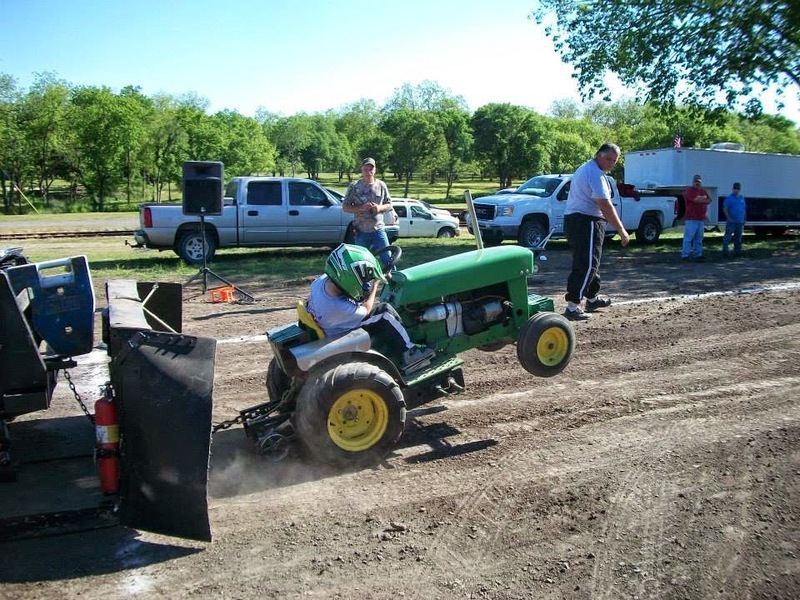 Claude Lewis scored the runnerup, with Aidan Hovind placing his 'Yes Deere' tractor in third. Kolby Langham rounded out the field, aboard his BSC entry. Stock Diesel was a tight battle, with Steve Hovind hanging on to win over Ken Langham, Jr. In Big Stock, Alex Jesko used a Full Pull to score the victory, with Patrick Bramlett scoring the runnerup aboard 'A-Muck'. Shawn Aufdenkamp pulled to third place, with Alton Degner and Jerry Toland scoring top five finishes. Kolby Langham piloted 'Texas Thunder' to sixth place. Stock Altered tractors saw John Aufdenkamp taking the win, with Alex Jesko and Ken Langham Sr. pulling to second and third places. 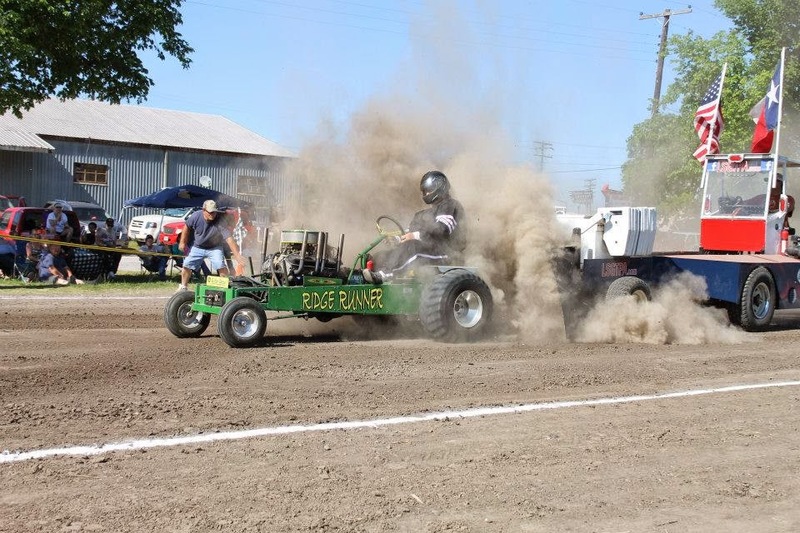 Todd Hickerson heads downtrack, during the Bonham Heritage Day Tractor Pull at Powder Creek Park. In the Motorcycle Class, Steve Pierce piloted 'Buzzards Roost' to the top spot, with Paul Smith riding his 'Texan' to the runnerup. Todd Hickerson pulled to a third place finish. Paul Smith returned with his 'Texan' tractor, to take the win in the Outlaw Class, while Todd Hickerson finished second, and John Aufdenkamp pulled to a third place finish aboard his 'Three of a Kind' triple engine tractor. The wild Mini Rod Class tractors put on a great show, recording multiple Full Pulls on the two hundred foot track. Sarah Moody emerged the winner, aboard her '99% Moody' tractor. David Houchen drove 'Back In The Day' to the runnerup position, and Jerry Toland wheeled his 'Shinin Time' tractor to third. Colby Crowe hung onto his 'Weekend Warrior' tractor, to score a fourth place finish. The Super Rod Class tractors closed the show, with Randell Moody taking the win aboard 'Ridge Runner', by a margin of just six feet, over John Kiemele aboard his 'Dodge This' tractor. Ken Langham, Sr. scored a third place finish, with the new Bonham Service Center tractor. Randell Moody takes the 'Ridge Runner' to a win at Bonham. Grace Johnson visits with Lane Duncan, after her National Anthem presentation during Bonham Heritage Day. 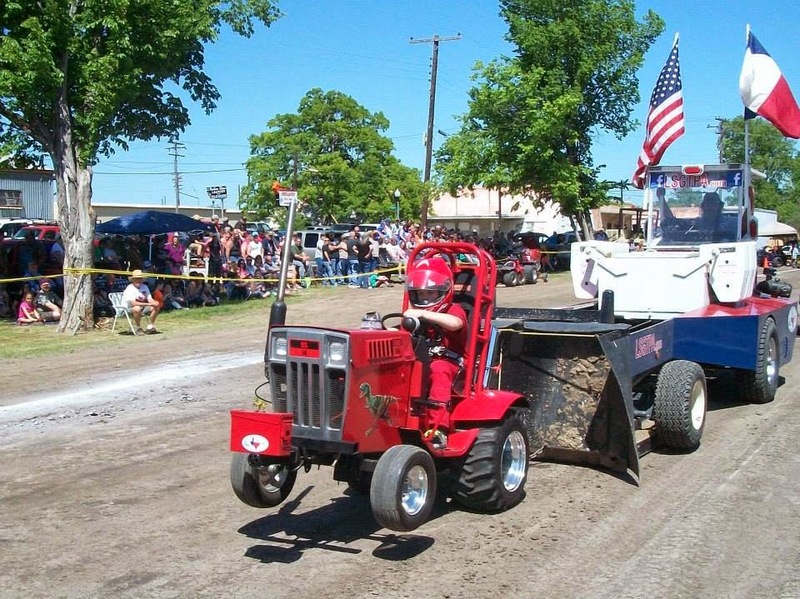 The Bonham Heritage Days Celebration activities will feature the LSGTPA tractor pulling teams, during the Saturday event on May 3rd. The opening ceremonies are scheduled for a 3pm start, and will commence with our National Anthem presentation by Grace Johnson, of the Bonham High School Chorale. The pulling teams will compete on the brand new Powder Creek Park Pulling Track, across from the Bonham Depot and along side the historic railway next to Powder Creek Park. Come spend the day in Bonham, Texas on May 3rd ! !